Microfinance has been touted as an instrument that can raise the incomes of those living below the poverty line. 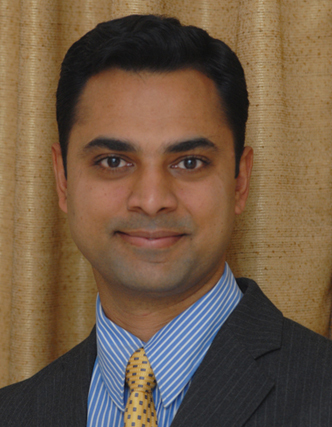 But, can the Microfinance Institutes (MFIs) also make profit while “doing good?” Professor Krishnamurthy Subramanian compares the nonprofit and for-profit MFIs to examine whether profit maximisation by an MFI compromises on its social objectives. In August 2010, Swayam Krishi Sangam better known as SKS Microfinance, a non-deposit-taking finance company, which is into the business of serving the financing needs of the poor in rural India, emerged as one of the most successful recent stories in the IPO market. Its public issue of stock amounting to `1653 crores, or $350 million was oversubscribed by about 14 times. The IPO’s claim to importance stemmed from its clients – not from their elite status, but rather the opposite. SKS was set up as what philanthropists call a “social enterprise” – a business based on the concept of doing well by doing good. SKS clients comprised primarily of low-income women who take loans to support tiny enterprises like neighbourhood shops, poultry farms, etc. The loans SKS’ clients seek are small – typically hundreds of dollars rather than many thousands – and the bank requires no collateral. It is a version of “microfinance”, the idea associated with Muhammad Yunus and Grameen Bank of Bangladesh, winners of the 2006 Nobel Peace Prize. For Yunus, microfinance can unleash the productivity of cash-starved entrepreneurs and raise their incomes above poverty lines. It is a vision of poverty reduction that centres on stimulating self-help rather than direct income redistribution. For the supporters of SKS, its public offering heralds a future in which microfinance routinely attracts investment from the private sector, freeing it from the ghetto of high-minded, donor-supported initiatives. As testimony to the power of the profit-making objective to serve the poor, SKS’ supporters point to the institution’s aggressive expansion. Between 1996 and 2009, SKS grew its number of borrowers by over 200% annually, quickly making it the largest microlender in Asia-Pacific. Microlenders can and should compete shoulder-to-shoulder with mainstream commercial banks, supporters say, vying for billions of dollars on global capital markets. such as SKS have become profitable by excessively indebting their borrowers without heeding to the borrowers ability to repay. created policy uncertainty about the sector in general and almost overnight, transformed the image of microfinance institutions (MFIs) from that of saviours of the poor to unfeeling usurers. The RBI report submitted by Y H Malegam has sought to bring some clarity but the matter remains far from settled. These competing reactions reveal diverging of views around the possibilities and limits of microfinance. Yet there are also areas of shared vision. All sides agree that the demand for reliable financial services is huge. According to a 2007 report by the World Bank, roughly 40% to 80% of the populations in most developing economies lack access to formal sector banking. All sides agree that access to reliable financial services might help hundreds of millions, perhaps billions, of low-income people currently without access to banks or at the mercy of exploitative moneylenders. Muhammad Yunus and Grameen Bank led the way by showing that with donor support, a wide range of poor and very poor customers are bankable – they can borrow and save steadily and pay substantial fees. 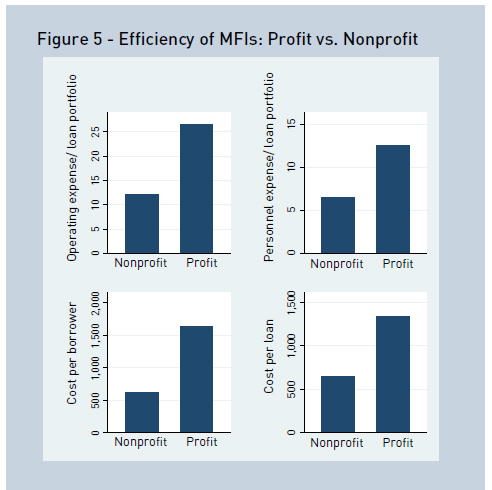 We find the operating costs and expenses for for-profit MFIs to be on average significantly higher than that for nonprofit MFIs, the for-profit MFIs pass on about two-thirds of these higher costs to their borrowers, which is reflected in the higher interest rates they charge when compared to their nonprofit counterparts. But the role of fully commercial, profit-seeking institutions in providing such microfinance loans remains controversial. By Muhammad Yunus’s depiction, MFIs such as SKS are nothing but brute moneylenders, the very beast that microfinance was built to root out. For Yunus, microfinance institutions should be “social businesses” driven by social missions. After all, like the nonprofit microfinance institutions that emphasise social objectives more than profit-making, SKS could have been substantially more prudent in disbursing loans and nonetheless expanded, although at a somewhat slower pace. For SKS’ supporters, though, the several hundreds of thousands of poor customers that SKS served would otherwise have had even worse financial options. Would not serving them be a better social outcome? Initial public offerings such as SKS make it possible to imagine investors funding microfinance globally at $30 billion per year, rather than the current $4 billion (as estimated by the donor consortium Consultative Group to Assist the Poorest, 2008). This hope makes it possible to imagine serving over one billion low-income customers, rather than the 133 million counted in 2006 or the 175 million projected for 2015. 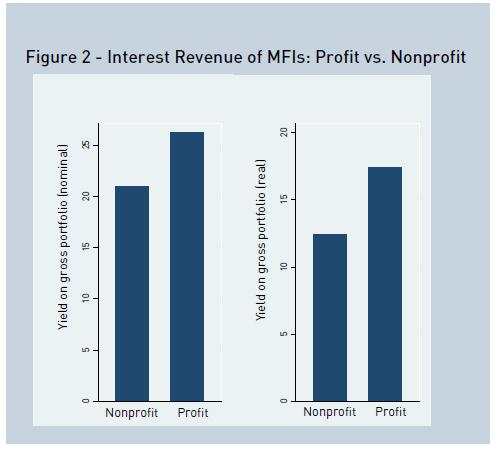 Since the for-profit MFIs would pursue profit maximisation disproportionately more than the nonprofit ones, in a recent piece of research, I compare these two categories of MFIs to examine whether profit maximisation by an MFI compromises on its social objectives. 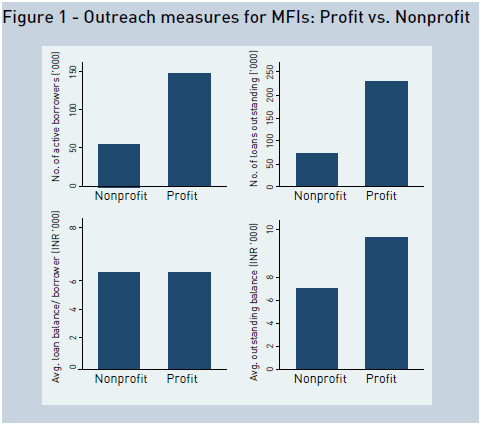 I find the following results: First, as seen in Figure 1, the for-profit MFIs in India serve more than three quarters of the microfinance clientele. Second, contrary to the fears that profit maximisation by an MFI would impel it to lend indiscriminately, we find no difference between the for-profit MFIs and the nonprofit ones with respect to: (i) the number of loans provided per borrower; and (ii) the outstanding loan balance per borrower. 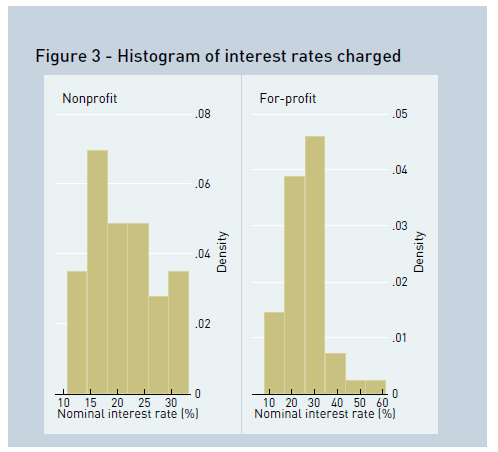 Third, as seen in Figure 3, the for-profit enterprises charge higher interest rates when compared to their nonprofit counterparts. Fourth, as seen in Figure 4, we find that close to 97% of the for-profit MFIs in our sample lend at nominal interest rates lower than 30%. 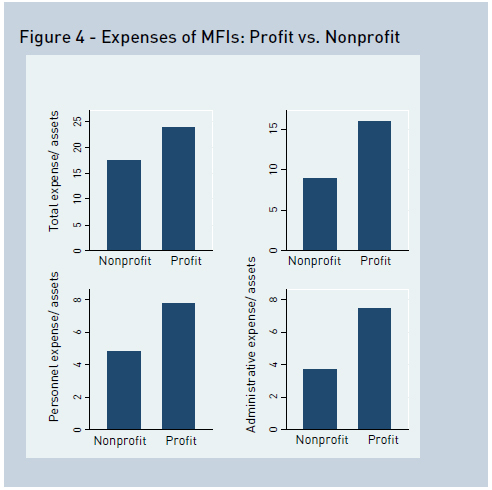 Fifth, surprisingly as seen in Figures 4 and 5, we find the operating costs and expenses for for-profit MFIs to be on average significantly higher than that for nonprofit MFIs. Sixth, the for-profit MFIs pass on about two-thirds of these higher costs to their borrowers, which is reflected in the higher interest rates they charge when compared to their nonprofit counterparts. Seventh, the for-profit MFIs in India are no more profitable on average than their nonprofit counterparts. Last but not the least, the lending portfolios of the for-profit MFIs in India are no more riskier on average than those of their nonprofit counterparts. The empirical findings indicate that apprehensions that profit seeking objectives of MFIs led them to: (i) charge usurious interest rates and/or (ii) push loans indiscriminately to their borrowers irrespective of whether the borrower’s debt capacity may be exaggerated. The close linkage between the costs and expenses faced by MFIs and the interest rate they charge their clients suggest that policy measures that increase the costs and operating expenses of MFIs will have detrimental consequences either in the form of increased interest rates charged or through credit rationing if a ceiling is imposed on the interest rates. Associate Professor and Executive Director, Centre for Analytical Finance.